Spring is the perfect time to start thinking about home improvements, whether that is having a good old clear out or having a whole-scale refurbishment. 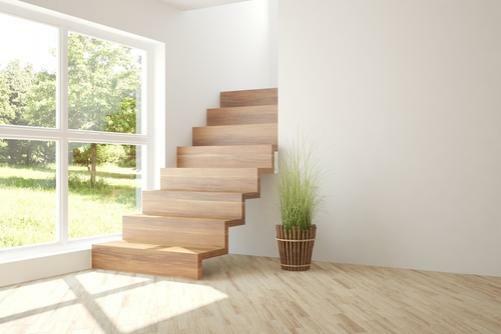 For those budding DIY enthusiasts looking for a new project to start on, have you thought about paying a bit more attention to your staircase? This is one of the most prominent features in your home, you use it probably more often than some of your rooms, so shouldn’t it be given a bit more of the limelight? The beautiful thing about refurbishing a staircase is that you can go big or you can go small. In other words, if you don’t fancy a huge DIY project, a simple sand down and repaint can make your stairs shine. Alternatively, you could have a look at the different staircase parts available and replace your spindles for ones with grander designs. Remove the carpet and switch to hardwood staircase parts. This takes up some time to remove the carpet and tacks then you need to use wood filler before sanding down. Then using enamel floor paint, prime both the tops and fronts of each stair and then you have a set of stunning wooden stairs. Replace the balustrade with a more modern design. Take a look at all of the different designs that are available now, there is no need to stick with the plain wooden designs that everybody else has. You can change your spindles from wooden to metal ones, or even just try a different style of handrail. Make your staircase open plan. If you have young children then this might not be a good idea from a safety perspective but if not, it can really transform the look of your stairs. Plus, you do not have to spend money on new materials as you are pretty much just removing the old spindles and handrail. It can also make that area of your home look bigger. A new coat of paint. If you just fancy a smaller change then you can simply give it a fresh coat of paint and see a big difference, as your staircase will have a new brilliant shine. Alternatively, you could strip the paint off wooden spindles and show the wood finish instead. It can be quite time-consuming to do but the finished results will look fantastic and will be well worth the effort. Whether you are a DIY master or merely an eager apprentice, Blueprint Joinery is on hand with stunning staircase parts that are ready to thrust your staircase into the spotlight.